We as Gujarati Jains, celebrate Diwali as the most important festival of the year. Not only does Diwali bring in the New Year, but also is very important as the business community celebrates their business during the festive period. Every year, we try to follow as many traditions and customs as possible and make the most of our #GharWaliDiwali. 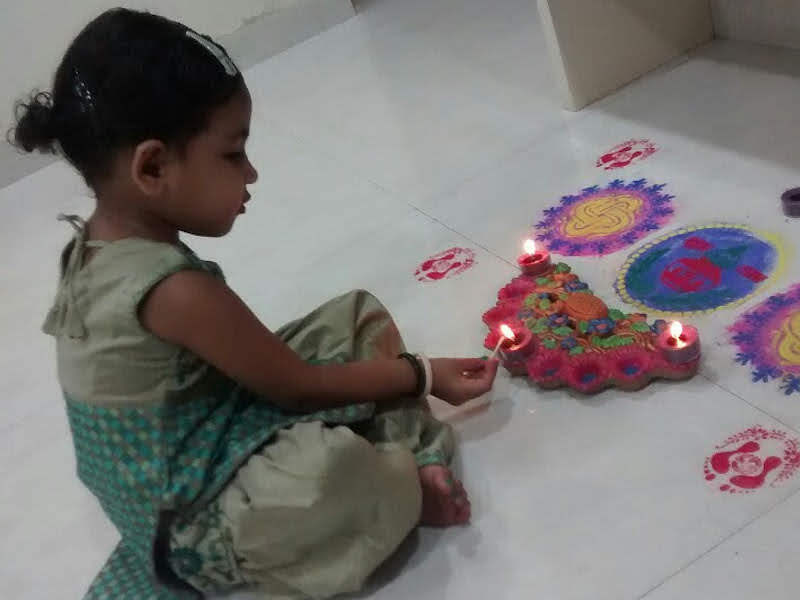 This year we are extremely excited to celebrate Diwali with our princess. I’d be decorating our home with traditional dias and beautiful rangolis. A spread of delicious sweet dishes along with some wonderful packed gifts for near and dear ones shall adorn our home. Dhanteras is celebrated as a day to honor Goddess Lakshmi, the goddess of wealth. We shall follow our ancestral tradition and purchase a few items that are considered auspicious on the day. First a new utensil in iron for our kitchen, followed by a beautiful light for the living room. Apart from the household items it is considered pleasing to Goddess Lakshmi to buy precious metals. My mother-in-law believes in buying silverware on this auspicious day and so keeping tradition we shall be bringing home a beautiful silver dinner set. And of course there will be a beautiful gold jewelry piece for our little princess. The next day is Kali Chaudas which falls on Aso Vad Chaudas, the day that is celebrated in honor of Goddess Maa Kali. It is the day that is celebrated as the day that good trumpeted over evil. Maa Kali killed evil king Mahishasura and brought an end to everything bad. As Gujarati Jains on this day we follow a ritual called ‘Kakarat Kadvo’ meaning removing evil and negative energies and rubbish from the home and placing it at crossroads to destroy it. We usually encircle our homes with a couple of limes and then set out to place them at crossroads near our homes. One must be very careful as not to step on limes laid out on the streets. It’s a small quick ritual that we shall complete at dawn. Diwali is celebrated the next day which is the most important day of the festive season. It is the last day of the Hindu year and a day to celebrate the business. In addition to all the celebrations, the Business Community prays by way of Chopda Poojan and Lakshmi Poojan. Books of business accounts are worshiped and set for the next financial year, along with offering prasad and gifts to employees. It is the big bonus day for the community. Lunch is served in the office and then the entire office is called to celebrate along with their families. Gifts and bonuses are distributed, lunch enjoyed together and then fire crackers are burst to make the arrival of the New Year. Since we are working professionals, we will celebrate the day with worshiping the cheque book, followed by lunch and gifts arranged for our house-help and their families. Our family usually plays card games on this day to try our luck and enjoy an evening of family fun. The day after is Besto Varas which translates as New Year. On this day, we generally go to seek blessings from our elders be it our parents, extended family but also most important Lord Mahavir. Elders usually give children good luck money on the eve of this wonderful new beginning. We shall wake up as early as possible; hopefully around 6 in the morning to visit the temple and then seek blessings from our elders. We will collect as many shagun Rs. 11 to bring in luck in the New Year. Bhai Beej is the final day of the celebratory season which emphasizes the sibling relationship. Brothers go to the married sister’s home for lunch followed by a small puja similar to that done on Raksha Bandhan. Sisters usually cook a sumptuous meal for her brother who in turn gives her loads of gifts. I’m going to this for my brother and enjoy the day together. It’s going to be an amazing few days. I cannot wait for the festivities to begin.